Pay Your Dues Renewals Online! The AAPSM is excited to announce that the upcoming scholarship is open to ALL AAPSM Student Chapter Members. The AAPSM serves to advance the understanding, prevention and management of lower extremity sports and fitness injuries. We believe that providing such knowledge to the profession and the public will optimize enjoyment and safe participation in sports and fitness activities. We will accomplish this mission through professional education, scientific research, public awareness and membership support. Access our website private area! Do you have a sports-related problem? A question for the academy? We welcome you to our website and hope you find it useful. If you are in the podiatric sports medicine field and are interested in AAPSM Membership, please click here. Prior to Steph Curry, there was “Super John” Williamson. Before anyone knew of Kevin Durant, there was Roger Brown. Before LeBron James dominated the NBA, Julius (“Dr. 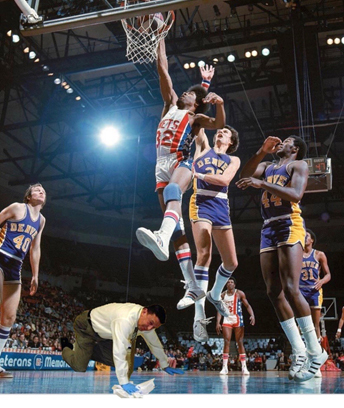 J”) Erving was “the man”. These players and the likes of Spencer Haywood, George “the Ice-man” Gervin, George “Big Mac” McGinnis, Dan Issel, Billy “the Whopper” Paultz, “Wondrous” Willie Wise, Zelmo “Big Z” Beaty, Billy Knight, Darnell “Dr. Dunk” Hillman, Will Jones, Artis “the A-train” Gilmore, David “the Skywalker” Thompson, Bob Netolicky, Billy Keller, Rick Barry, the Kentucky Colonels, the Virginia Squires, the San Diego Conquistadors, the Dallas Chaparrals, “Dancin’ Harry”, etc. were household names in the American Basketball Association (ABA). Created in 1967 to compete against the established National Basketball Association, the American Basketball Association featured a more wide-open style with a red, white and blue ball, the 3 point shot, a slam dunk contest at the all-star game, and a 30 second shot clock. Franchises were located in markets like Indianapolis, Louisville, Norfolk, VA, St. Louis, Salt Lake City, Denver, etc. Slowly but surely, the level of play in the ABA rivaled that of the NBA, and many top college players were drawn to the new league. Unfortunately, by the mid 1970s, finances became an issue and a few teams were disbanded. Four teams (New York Nets, Denver Nuggets, Indiana Pacers and the San Antonio Spurs) eventually merged with the established NBA, and the ABA was no longer. After the merger, the other NBA teams acquired some of the former ABA players who were not members of the 4 franchises involved in the merger. 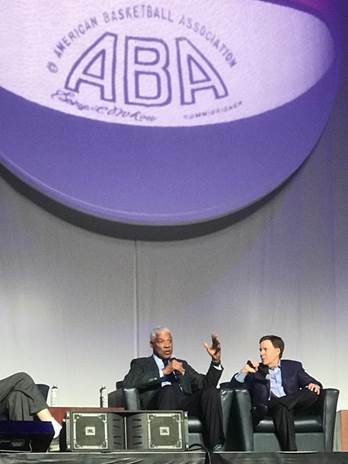 But, many of the former ABA players no longer had jobs, and the defunct ABA offered a less than ideal pension and no long-term medical care for the former ABA players. In addition, former ABA players who did not play long enough in the NBA to be included in their pension program were also dealt financial misfortune. Seeing a need to help these former professional basketball players, Scott Tarter, and Dr. John Abrams founded Dropping Dimes Foundation (DDF) in October of 2014, and film producer Ted Green joined the team afterwards. This not-for profit foundation (Indiana 501 C -3) has been able to locate approximately 350 former ABA players (see www.droppingdimes.org). A majority of these players are now between 64 and 80 years old, and many are experiencing financial and medical hardships. The organization is dedicated to their well-being, and the health and happiness of their families. Since its inception, the Dropping Dimes Foundation has been involved in a number of activities focused on `improving the quality of life for these former ABA players. The development of a prescription help center provides cost savings for medications. Former Indiana Pacer, Charles Jordan, was able secure a suit for a church event with the help of DDF. Ron Thomas, a former Kentucky Colonel, was the beneficiary of a DDF road trip to his nursing facility that included a brand new wardrobe. A former Miami Floridian was in medical need of oral surgery due to recurrent abscesses. DDF, Dr. Steve Green (former Indiana Pacer), and 2 Indianapolis oral surgeons were able to provide the necessary care. A former New Orleans Buccaneer (and his wife) had suffered strokes and their Arkansas home was vandalized and not livable after an extended stay in a nursing home. Dropping Dimes was able to temporarily relocate the couple into a hotel while addressing the issues at their home. Knowing that these men have logged countless hours on the hardwood, had multiple lower extremity injuries, and are now battling father time, there exists a great opportunity for our organization, the American Academy of Podiatric Sports Medicine to make a difference. That is, I am looking for a few good men (and women) from the Academy to be involved in a network of AAPSM Members and Fellows that is available to the Dropping Dimes Foundation and the former ABA players. When such a player requests podiatric care, he would be provided this list of AAPSM podiatrists in his area, and I would be involved in matching the player with a podiatrist. Of the 350 living ABA players, between 100 and 150 players may lack adequate healthcare and the necessary resources. In the scenario where the player may not have insurance, the AAPSM will work with Dropping Dimes Foundation in making sure that all services and procedures are not provided “en gratis”. In the 1970s, your author and Dr. John Abrams were ball boys for our beloved Indiana Pacers. Working under the direction of long-time Pacers athletic trainer, David Craig, ATC, we had many duties. We cleaned uniforms, washed towels, rebounded balls, ran errands, swept the floor, etc. All in all, it was our responsibility to make sure that players like “Dr. Dunk, “the Iceman”, “Dr. J”, “The A-train”, “the Skywalker”, etc. were able to compete at their highest level, and were “cleared for landing”. Now, nearly fifty years later, we want to be sure that their “landing gear” is void of defects and they are able to live “free of turbulence”. Note: Please contact AAPSM Executive Director, Rita Yates, (ritayates2@aol.com) and/or Dr. Alex Kor (akisok15@hotmail.com) to be involved in this new initiative between the American Academy of Podiatric Sports Medicine and the Dropping Dimes Foundation. As a valued Fellow of the American Academy of Podiatric Sports Medicine, we want to thank you or your continued support of the AAPSM. Through your loyal support, the AAPSM is able to remain in the forefront of the podiatric sports medicine profession. Being a Fellow of the AAPSM indicates that you have gone that extra mile and have proven your passion for sports medicine. Part of your responsibility with the AAPSM and in order to retain your fellow status, you are required to attend one (1) AAPSM sponsored event in a 5 year period. Beginning this year (2018) the AAPSM will begin enforcing this requirement. Therefore, we wanted to take this time to invite you to a few of our upcoming AAPSM sponsored meetings. These following meetings will be held over the next year or so and will assist you with the Fellow requirement. The list of eligible events will also be updated on our website at Also as a reminder, you will need to remain current with your annual dues which run from July 1-June 30. Should you have any questions or concerns, free to contact Executive Director Rita Yates at ritayates2@aol.com. The AAPSM hosts a series of meetings throughout the year held at the various colleges of podiatric medicine offering special discounts and CME units. AAPSM operates a consumer referral line where consumers call and receive an AAPSM member in their area. AAPSM website featuring member and consumer information including a newly formatted “members only” site featuring a variety of PowerPoint presentations, bookmarks and brochures. An informative newsletter that includes journal reviews, student chapter updates, information on upcoming meetings, seminars, etc. Opportunity to achieve Fellow Status. Participate in special AAPSM projects such as Special Olympics, etc. Media exposure through national, regional and local magazines and newspapers.